Fiji – Sometimes the wrong train will get you to the right place. We eventually touched down on a stretch of land in the azure seas, some three hours after we left Samoa. The land was not what one thinks of when one thinks of Fiji, as much of it was industrialized and paved over with tarmac. 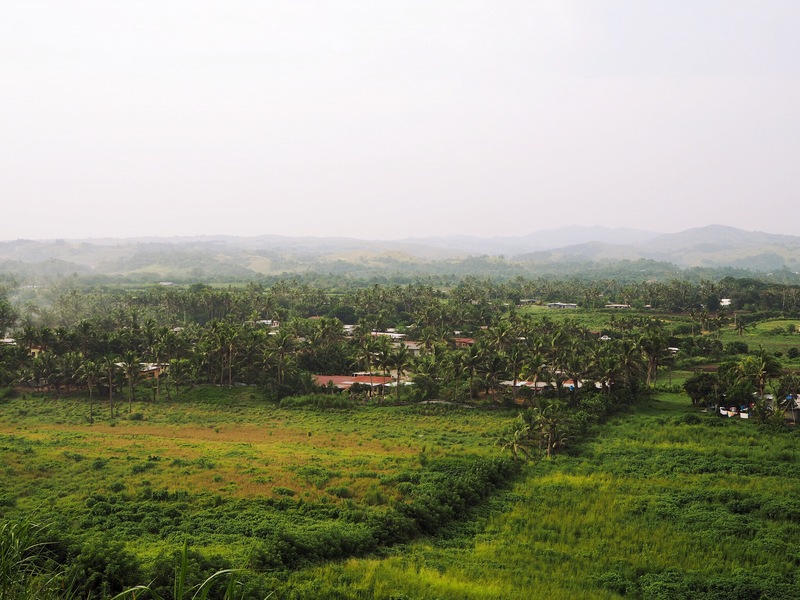 This was Nadi, on the largest island of Fiji, Viti Levu, but still a far cry from “large” cities elsewhere. Its sprawl reminds one of the suburban outskirts of some nondescript western city of several million. We had a reservation at Bamboo Backpackers, as the crow flies not far from our current location, but getting there requires a huge up-and-back around the airport runway. The hostel organizes free airport pickups, and there were several of us going in that direction. They whisked us over to their outfit, in a neighborhood called Wailualua. This particular corner of Wailualua is inhabited almost exclusively by similar accommodation for tourists, and it was quite clear that we were back on something of a tourist route, if we were off it before. Scantily clad westerners on beach holidays were to be found everywhere, in fact, it was several minutes before we even spotted a local, and they were part of the hostel staff. We checked in, along with a dozen or so others. Our room was private and air conditioned, yet for a surprisingly affordable tag, which we guess is a result of the tourism industry here. The grounds were nice, and the hostel is entirely self-sufficient with a bar, a 24 hour cafe, a juice stand, even an ATM. Yet for any further needs, there’s a super market and a decent Korean restaurant several hundred meters away. We truly were in the suburbs though, and it was a 15 minute bus ride to the city center. The view from our room at Bamboo Backpackers. The buses were not quite as cool as their Samoan counterparts, but ours got us where we needed to go, and with some music at a modest volume to boot. The city center of Nadi is quite like that of a smaller town in India. This is no surprise as Fiji’s population is more than 30% Indian. This same concentration gives Fijian cuisine a uniquely South Asian twist compared to the other Pacific islands, and after not eating all day we were looking forward to checking that out. We settled on Tata’s on the south side of the city center, and were not disappointed. As we sat with heaping bowls of fish curry and roti, we were surrounded by countless other Indians, speaking a version of Hindi, eating with their hands just like we were back in India. The food was an amazing initial foray into Fijian cuisine, and we were looking forward to our next meals. We wandered around the dusty streets of Nadi after that, and concluded that there isn’t much to see. We eventually caught the bus back up to our neighborhood with the help of some local kids. Our next day and a half in Nadi was quite relaxed, with us staying mostly within the confines of our neighborhood. Fiji consists of many dozens of idyllic islands, differing radically in geological makeup and modestly from a cultural perspective. They are nearly all difficult or expensive to get to, but well worth the trip off the main island. After much research into the matter, we doubled down on the Yasawa Islands, booking two places in the island string for the following week. The decision was mostly financial, considering that the flights to Kadavu and Taveuni (both potentials of ours) were quite expensive (at least $300 per person round trip). Most islands also have ferry/cargo ship connections as well, but these run weekly at best, and the trip to Taveuni is long. Our mere 12 days in Fiji limited us to places that were easy to get to. Our first hotel, Coralview, on Tavewa island, operates their “seabus” (a small catamaran) from Lautoka straight to Tavewa and the surrounding islands in the northern extents of the Yasawas. Likewise, the trip is only ~$35 per person (a steal compared to other fast transport in Fiji) with a booking at Coralview (pro tip: email Coralview to get a booking number for the boat trip to secure the discount, as they’re happy to charge anybody the full fare). Likewise, they operate a shuttle bus from Nadi to Lautoka for only $3.5 (also with a booking). The boat ride was a nondescript 3 or so hours, starting at 8am from the jetty in Lautoka. The trip was mostly over open water, but as we neared the Yasawas, we finally saw what people come to Fiji for. The seabus parked off the coast of Tavewa, and speedboats from several different hotels in the area (most islands in the Yasawas have some sort of hotel on them) zoomed to and fro, picking up people and supplies from the arriving boat. We were shuttled to the shore in a small, open topped vessel, and greeted by the hotel staff singing and playing Fijian songs on a guitar and ukelele. The hotel staff was very friendly, and they showed us to our room. We booked the cheapest possible option, in the dorm, and were expecting the worst. Our room was a pleasant surprise though, decked out with air conditioning and an army of ceiling fans. The 10 beds were also each separated by a half wall, giving a bit more privacy, but there were only two other guests in ours, so there was no shortage of that. We were fearing that the Yasawas would be overrun by the worst kind of tourist, due to their ease of getting to, but were pleasantly surprised. The hotel had some other guests, but people mostly kept to themselves, and much solitude could be gotten. The daily rains (separated on both sides by beautiful blue skies) of the wet season certainly contribute to this, but that’s a small price to pay for a relaxing, relatively tourist-free time in Fiji. We spent our time living the island life, relaxing on white sand beaches, dunking in the crystal clear waters, going for a snorkel along lively reefs, and doing the occasional hike to the top of our local, grass-covered piece of paradise. Savuti beach on the south side of the island was particularly memorable. It was not a short walk from our hotel, but it was well worth it. Under the scorching mid day sun, we walked under cover of palm leaves through local villages, little children ran to greet us. The beach was backed by a verdant palm forest, and at low tide one can nearly walk to the next island. The water was so clear that the sandy seafloor shown brilliantly up through the depths. There is a cell tower at the top of the island, and the area near the top affords generous views of the surrounding islands, and on the leeward side, out across the ocean towards Vanuatu. The hike up to the top is easy, but with a fair amount of elevation gain and bush whacking. Ian climbing the cell tower on top of Tavewa. We visited the Sawa-I-Lau caves, just north of Tavewa, which was a definite highlight. It’s the same location that a large portion of the 1980 film Blue Lagoon was filmed at. The cave is filled with a mix of salt and fresh water, and it’s entered through a stairway leading into the depths. The first cave has a mostly open top, so it’s fairly well lit, but the bottom is many meters below. The second cave, however, is the real attraction. Only accessible via a shallow dive under a few meters of water, underneath a submerged rock arch, the second cave is nearly pitch black, with only a hint of blue light shining in through the underwater passage. Fresh air makes its way down through a very long, very narrow passage to the sky above. We navigated through the caves with snorkels and fins, with our guide deftly diving to explore the depths below with a flashlight. We went snorkeling along the reef next to our island that afternoon, and were treated to brilliant coral formations and brightly colored fish of all manner plying the depths. Oona even spotted a shark, but Ian was slow on the uptake and missed it. Nevertheless a wonderful experience. Near the end, another couple from our hotel pulled up in a speed boat, they were doing a snorkel tour, so we joined in for the final portion. We abandoned our fins for the shallow water ahead, and jumped in to have a look at the giant clams underneath the surface. Unfortunately we didn’t bring a camera for the impromptu session, so we missed out on recording the event, but these clams were by far the biggest we’ve ever seen. With shells so big you could nearly stick your entire head inside, they hung on the bottom, feeding off this or that that came their way. A quick poke to the purple, fleshy inside and they would snap shut. We had a lovely time on Tavewa, and packed up to head south to Nanuya Balavu island on the Yasawa Flyer, which is an exorbitandly expensive catamaran (aimed at tourists) that runs between Tavewa and Nadi on a daily basis. We arrived at Manta Ray Resort, and things were palpably different from our previous hotel on Tavewa. While the furnishings were nicer, and things were generally better put-together, it was undeniably more commercial; surely meant for handling heavier loads. We took a seat at the bar area up front, and in that room alone there were already more than twice as many guests as there were at Coralview. It seems that the northern islands in the Yasawas chain are less frequently traveled, as a result of their distance from Nadi. Halfway down the chain however, things are different. Perhaps we’re now jaded, having been on the road for an extended period of time. We’ve found that we have a harder time fitting in places with younger crowds these days, which we suppose is a natural side effect of getting old. Nevertheless, we settled into our dorm, the median age of which was surely at least five years younger, and concluded that we wouldn’t be the crusty old couple that we inevitably were. The common area at Manta Ray. The weather was awful for our days at Manta Ray, so Oona did the only thing suitable for such weather, which was a dive. Being the certified rescue diver that she is, going on a dive is nothing new to her. This dive was not particularly noteworthy, other than seeing some turtles and sharks, however. The staff and other patrons were fairly rude though, making her decision to not do another dive easy. The weather sucked pretty much the whole time we were there without exception, and we generally didn’t enjoy the place that much, so there’s really not much more to say on the matter. Oona fell ill while we were at Manta Ray, so we skipped our last night (which we were actually pretty happy about) to go see a doctor in Nadi. Unfortunately Manta Ray would not reimburse us for any amount of our last night, but they didn’t charge us for the food that day, at least. To make our experience even worse, the previously-mentioned exorbitantly expensive Yasawa Flyer, for some reason (because they can, surely), charges a flat rate for any transfer back to Nadi regardless of distance. This means that we paid FJ$89 ($42 US) per person for our trip from Coralview to Manta Ray, plus FJ$168 ($80 US!!!) per person to get from Manta Ray back to Nadi (roughly the same distance as the first leg), for a grand total of a lot more than the cost of the journey from Coralview back to Nadi. If we had any respect for the Yasawa Flyer before this (hint: we did not), it was entirely gone by the time we got back to Nadi. In retrospect, we would have been much happier (and wealthier) taking the discounted Seabus up to Coralview and back, forgoing any other islands in the chain. We managed to drown our sorrows in kava, however, the night we arrived. 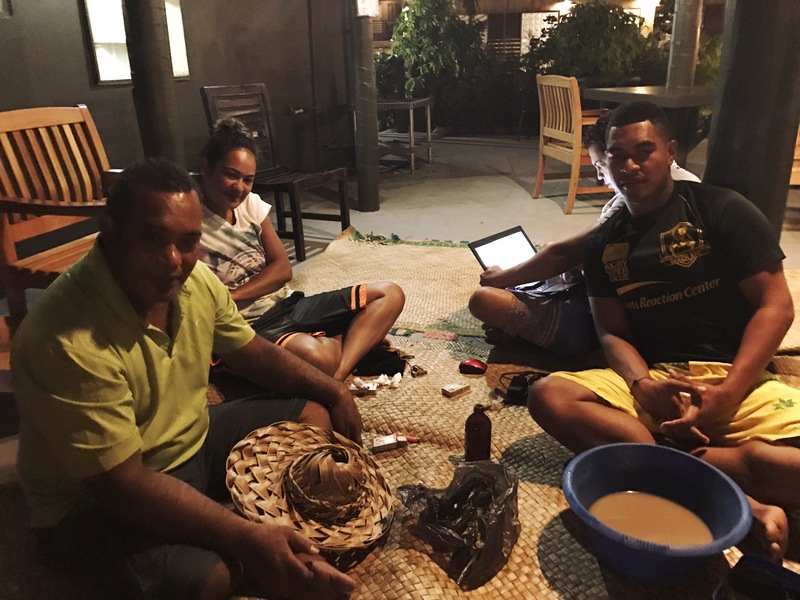 Kava is a drink made from the root of a native plant, and it is mildly psychoactive, giving the drinker a feeling of ease and relaxation; it’s the national drink of Fiji, and they take it very seriously. Most families in Fiji gather round the kava bowl every night to spend hours drinking the tincture. Most hostels in Fiji also dedicate a night or two per week to it to allow the tourists to dabble. We spent a few days in Nadi on the way down to Sigatoka, on the south coast. Our decision to go to Sigatoka was mostly economical, as we had neither the time nor energy to go to some far off, mystical island. Sigatoka looked like an interesting enough place, with a relatively nice little town center and a large, beachside sand dune. We were also pointed in the direction of the Tubakula Beach Bungalows as an affordable place to stay by a few fellow travelers. We took the bus from the Nadi bus station and got off after an hour or so, just in front of Tubakula. The place seemed nice, and was entirely devoid of guests. The check in procedure included the endless checking of boxes on some overly-detailed checklist, making sure that we wouldn’t run off with the sheets or surge protectors. We spent the afternoon in Sigatoka after we hopped on a local bus back to town. We were nearly convinced of buying a huge, wooden mask in the traditional Fijian design, from the popular souvenir shop, Jack’s. The mask was beautiful, but the price tag including shipping was enormous. We also didn’t like the idea of shopping from a huge chain, which clearly doesn’t need our patronage to make ends meet. We left, having concluded that we’d think about it. Not long later a shop owner came out and talked to us a bit, which is something that happens very regularly in the towns of Fiji. He invited us up to his shop, and we were immediately sold on a mask that his late father had carved. His initial asking price was half that of Jack’s, and we managed to talk him down yet more, including shipping. He was originally from the island of Fulaga, which is famous for its woodworking residents. His teenage son sat in the corner carving a smaller mask. We left, happy with our spontaneous purchase, and much happier about supporting a local merchant. Kava at the Sigatoka market. The following day we headed to the Sigatoka sand dunes, some 15km away from Tubakula. We took the local bus from Sigatoka, chock full of school children, and the driver beckoned us up to the front once we reached a nondescript dirt driveway. At the end of the driveway was a steep footpath through the sand to the top of the dune. We tried first with our shoes off, but the sand was so hot that within seconds our feet were burning. 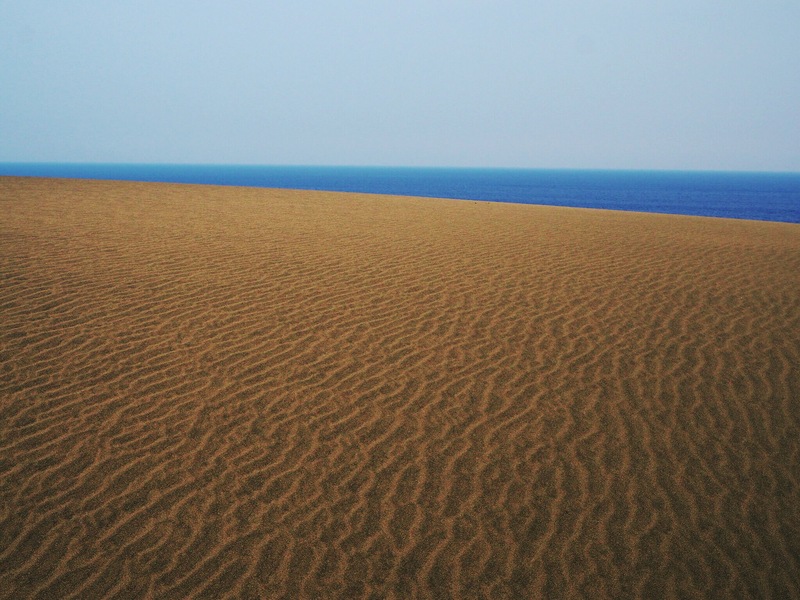 Once we made it to the top, the blue horizon filled our vision, with undulating, golden dunes in the foreground. We spent an hour or so strolling along the flat portion atop the dunes, but the afternoon sun was bearing down on us with incredible intensity, so we headed back to town. We had another day in Nadi on our way out of Fiji, which surprisingly didn’t really bother us. Fiji was a bit of a bust for us, which is probably due to improper planning and too high expectations. We found ourselves fondly reminiscing on our time in India, nearly 10 months prior, no doubt due to the huge Indo Fijian population here. We found that the idyllic white sands and paradise islands were too commercialized and inaccessible, so the things that we ended up enjoying the most about Fiji were the gritty and dilapidated cities, harking back to our days on the subcontinent. The thought of someday missing India when confined to its sweaty, strangling bustle would would be laughable, but as the Finns say, aika kultaa muistot, or “time makes memories golden”. The interior of Viti Levu. A Hindu temple in the countryside. Nevertheless, had we prepared for the sheer expense of getting to, staying on, and getting away from the islands, we would have had a better idea about what to do. On paper, the Yasawas look accessible, but the boat costs nearly as much as airfare to some of the farther flung islands, so for those seeking solitude and adventure, a trip to Taveuni or the Lau Islands would have been a better bet. Taking a ferry to such islands is possible, but only with time and advance coordination, which is something we were lacking. Needless to say, if we find ourselves in Fiji for a second time, we’ll get in touch with our mask carver to see if we can stay with his family on Fulaga. A small village in the Yasawas. Lord, the caves! the beaches! It’s all pretty awesome. You guys are starting to get worn out from traveling, though, and I can’t blame ya. Come on back for some nestling & cocooning. “The younger crowds” and “getting old” — har! You ain’t seen nothin yet! Damn this takes me back to 1883 when I was a world travelin snapper, yep…we took a cargo boat out to some outlier island off Fiji and brought bags of sugar and flour and canned spam to pay for a stay in a village that looked VERY similar to that last photo. Sat around and drank kava with the menfolk, were grilled plaintively about modern contraceptives by the womenfolk (separate occasion) and even attended a funeral with wailing women and news going around the island via drumbeats. Played cards with the incessant bands of kids, kept stepping on squishy sea cucumbers when we’d explore the reefs. Are you making your way across the ocean to S. America soon? So fun to travel vicariously through these pics. Even looked at real estate in Samoa….not cheap, may as well be Hawaii! Carry on! Dang! Who knew you were so well-traveled?! We’re actually heading the other way after this, back through Australia, Southeast Asia, Southern Africa, etc. We’ll be in New Mexico in September, planning on Seattle for grandpa’s birthday though. Looking forward to swapping stories when it’s all over! Pingback: Thailand: Chumphon Archipelago – Sometimes the wrong train will get you to the right place. Pingback: The Big Trip – Sometimes the wrong train will get you to the right place.